The DTA’s new oversight and advisory role is giving government a clearer picture of how major ICT projects are tracking in terms of their health and delivery of benefits. Dr Lesley Seebeck, our Chief Investment and Advisory Officer, talks about the early insights being gained from the data collection work to date. Caption: an image showing information about ICT investment across agencies. Six months into this unprecedented oversight work, the government is gaining insights into where ICT investment is being directed and how those investments are performing. Caption: Pie chart showing ‘Engage’ category projects. These projects are closely monitored due to complexity or strategic importance. Based on our data collection to date, there are currently 72 initiatives that fall within the scope of a major ICT project with a budget of $10 million or more — these numbers continue to change as we collect new data. 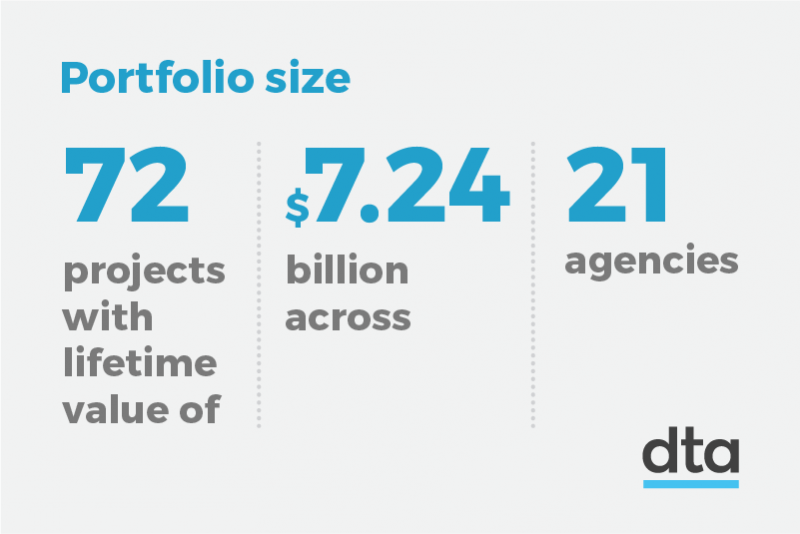 Of the 72 projects, 17 are in the “engage” category. These are projects that are generally highly complex, are of high strategic importance to the government, are of significant investment or where a project needs a renewed focus to ensure it’s delivering on its intended benefits. The nature of the DTA’s involvement in the ‘engage’ category varies based on the unique circumstances of each initiative. In some cases we provide light touch advice, through to active membership in project governance boards, providing specific expert advice and embedding staff within the project itself. It is important to note that accountability for the successful delivery of the project resides with the sponsoring agency. Currently, our data collection shows us that the greatest ICT spend in government is on projects focused on protecting and securing the nation, followed by building national level ICT capability and assets and then service delivery. Caption: Bar chart showing the investment focus by portfolio. As our data collect matures we’ll get greater transparency of the work being done on service delivery. This is where the positive benefits are passed on to individuals and businesses directly. Through our oversight and advisory role, we also assess new ICT proposals to make sure they align with the government’s transformation agenda, that they’re using the right approach and will deliver real value. So far this year, we’ve assessed and provided recommendations to government on 16 initiatives worth more than $2 billion in total. We’re also working with more than 16 agencies on new proposals that will be considered as part of next financial year’s budget. We continue to grow our capability. This will help us develop greater insights into ICT investments, deliver better support to the projects that need our help and provide the advice that government needs. Digital transformation is a big job and we remain committed to it.